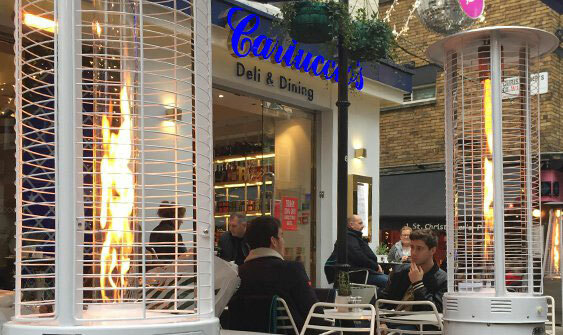 If chilly weather and draughty conditions are preventing your customers from enjoying your outdoor area, our commercial patio heaters are a sure-fire way to keep the crowd in high spirits. 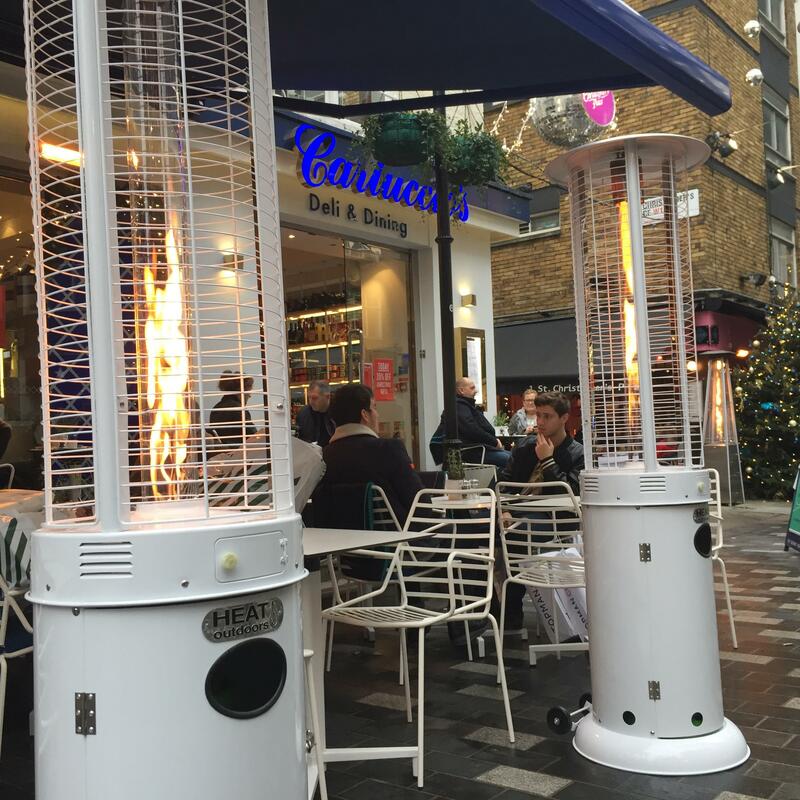 Popular for use at pop-up events and in hotels, construction sites and outdoor dining establishments – commercial outdoor heaters keep the good times rolling for customers and maintain a comfortable working environment. Commercial premises are busy places by their very nature, so keeping things comfortable indoors and outdoors is vital for commercial success. Not much sends evening crowds scurrying home like a draughty beer garden or ice-cold terrace bar. Thanks to the changeable British climate, this is an all-too-common scenario for many hospitality and entertainment venues. Some owners are also put off investing in patio heating systems because they assume the overheads will be high – thankfully, this is far from the truth. Here’s how to heat your outdoor space without spending a fortune on the heating bill. Infrared commercial outdoor patio heaters are less expensive to run than convection and commercial outdoor gas heaters, so they’re an excellent solution for outdoor commercial spaces. Instead of pumping heat into the air, infrared models beam invisible and perfectly safe electromagnetic waves straight onto people and objects in their path. These waves only convert their energy into heat when coming into contact with a solid object, so warmth can’t blow away or be wasted. Because no heat can escape, infrared heaters are able to produce the same level of warmth as other categories of heater, but at a much lower wattage. This saves you money on your monthly energy bill, and it’s pretty good for the planet too. As a rule of thumb, a 600W infrared heater produces approximately the same level of comfort as a 1.5kW convection heater, making infrared a highly economical all-day heating solution. As well as minimising energy wastage, infrared provides instant warmth – from the moment a chill sets in, it keeps your customers in a cheerful spending mood. Zone heating is one major step that commercial enterprises can take to reduce indoor heating bills, while keeping their environments warm and pleasant. It’s also another way that infrared heaters can really save money. Zone heating is a strategy that focuses on warming only the parts of a building that are currently being used, enabling businesses to be proactive about the area(s) of their establishment they heat at any one time. For instance, a restaurant might turn on its central heating system and its outdoor patio heaters during busy trading hours only. In quieter periods, it might switch over to a series of infrared heaters installed in key locations and spaces where conventional heaters may not be suitable. By using infrared units to warm a limited number of focal areas and a selection of ‘problem zones’ (e.g. areas where doors open regularly and cause draughts), a business can make smart savings on its electricity overheads. Whatever your commercial heating needs, our expert team are on hand to discuss your specific requirements. We can tailor our service to provide the perfect heating solution for your business – on time, on budget and adjusted to suit your particular business environment. Simply call 01279 466 500 or email [email protected] to speak to one of our advisors about any of our commercial heaters. To get the most out of our conversation, here are some things you might like to consider before you call. The more expansive your environment, the trickier it can be to achieve a consistent level of comfort throughout. Large-scale commercial patio heaters such as our Shadow Noir 3200W generate a powerful cascade of warmth over a generous area, making them ideal for covered markets and flexible indoor-outdoor spaces. Ensuring heat is evenly distributed – and producing no garish infrared light – the Shadow Noir is a discreet way to keep customers warm without the need for multiple small heaters cluttering the space. Compact spaces such as courtyards and hotel balconies only get the sun for short periods of the day, so they benefit greatly from a patio heater. Your customers should be able to enjoy these intimate environments without getting chilly, but they certainly won’t appreciate being roasted. Patio heaters may be small but they’re also powerful, so remember – less is more. Opt for a small, discreet model such as the Shadow Ultra Low Glare to avoid overheating the space. Better yet, why not browse our full range of infrared patio heaters and find a compact heater that’s just the right size for your space. If you run an events business or pop-up enterprise, you’ll need a heating solution you can take on the road, assemble and dismantle without any fuss. 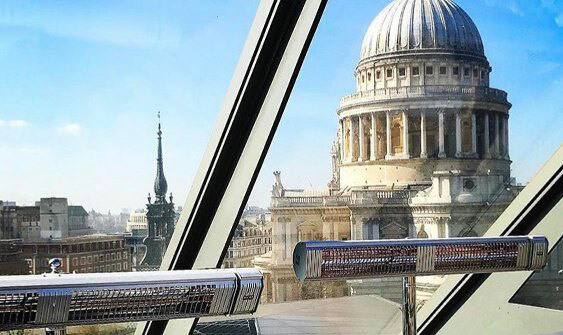 A growing demand for portable heating solutions at pop-ups, outdoor concerts and wedding receptions led us to develop a stainless steel stand for our ever-popular Shadow XT infrared heater. Made from highly polished tubular steel, the stand is easy to transport, can be assembled in sections and has a built-in cable management system to minimize trip hazards at your event. With an optional telescopic stand for flexible height and a weighted base to keep your heating unit nice and sturdy, the Shadow XT’s mobile stand is far safer and more versatile than a tripod. Along with our other portable solutions the Guadalupa and the IMUS Eco heater, providing stylish, instantaneous heating at your event couldn’t be easier. All you need is a power socket, and the heat is on!